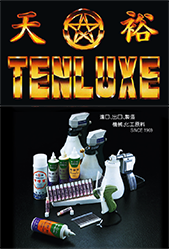 Tenluxe was founded in 1968 and is headquartered in Taiwan. We specialize in the research and development of ink cleaner products for textile materials. Its ink cleaner product / textile cleaner offerings include textile cleaning gun, trichloroethane naphtha, ink cleaner, tenluxe inkcleaners, puff ink cleaner, snaxin ink cleaner, cleaning spray gun, tag pin gun and lubricant for high speed knitting machine. The development of cleaning additives, including TENNOR AF202, BESCON and Tensoft, took the textile industry into the mechanized era and made the scrubbing of knitted sweaters produced for export by hand a thing of past. We purchased sophisticated West German and Japanese machinery that were ultimately used to produce Taiwan’s first aluminum electric cleaning spray gun. Named the TENLUXE TEXTILE CLEANING SPRAY GUN, this was granted the new utility model patent No. 6111. Due to developments in circular weaving machines and the ready-wear industry, Tenluxe released the compact Tenluxe Tag Pin Gun and tag pins; for cleaning applications, Tenluxe released the Inkcleaner and Inkcleaner GF series as well as the Snaxin series of cleaning light oil and water stains. These expanded the range of oil stains that can be cleaned from textile products, turning fabrics of clothing back into valuable merchandise again quickly and simply. The millions of dollars in savings every year made these products indispensable to the textile and clothing industry.